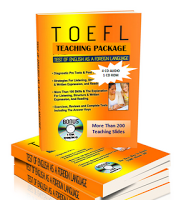 TOEFL (Test of English as a Foreign Language) is an English Test designed and developed by ETS (Educational Testing Service) in New Jersey, USA since 1963. What is TOEFL Test For? TOEFL Test is aimed at measuring the student's proficiency in academic contexts. The purpose of the test is also to evaluate the English proficiency of non native speaker of English. It is required by English language colleges and universities. Additionally, institutions such as government agencies, business, or scholarship programs may require this test. Next Article is Types of Toefl Test.